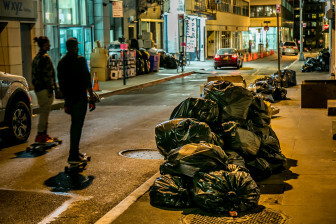 A 2012 study estimated that the city generates between 3.5 million and 5.5 million tons of commercial waste per year and counted as many as 79 different carters operating in one Midtown district. The study was announced in April as part of the mayor’s OneNYC sustainability plan. It aims to find out if a new, exclusive franchise system for commercial-waste routes would be more efficient than the current model of open competition. Advocates say franchising is the only way to reduce truck traffic, raise recycling rates and ensure good working conditions. Private carting companies, however, say that approach would put many of them out of business and are looking for alternative ways to change their industry. This debate played out very publicly in the spring, but has grown quieter as the city becomes more involved. The Business Integrity Commission (BIC)—the industry’s regulatory agency—teamed up with the NYU Center for Urban Science and Progress for the study and projected it would be complete within six to nine months. City Limits has learned that issues with obtaining data have put them behind schedule and prompted the Department of Sanitation (DSNY) to step in. Sanitation Commissioner Kathryn Garcia confirmed this after a recent City Council hearing. BIC’s issues with obtaining accurate data were the main reason for delay. Carters said they’d never been asked for such specific information before and some struggled to provide it. They sent reports in a variety of formats, ranging from handwritten notes to electronic spreadsheets, which also slowed down the process. DSNY has conducted a similar study before, but it was interrupted due to budget cuts during the financial crisis and considered inconclusive. Results published in 2012 estimated that the city generates between 3.5 million and 5.5 million tons of commercial waste per year and counted as many as 79 different carters operating in one Midtown district. Activists from Transform Don’t Trash, a coalition of labor and environmental groups, point to this study as evidence of an inefficient system that lacks transparency. They have long been the most vocal critics of the private carting industry, though have recently dialed back their rhetoric because they’re having productive discussions with City Hall. Gavin Kearney, director of environmental justice at New York Lawyers for the Public Interest, says they’re trying to strike a balance until the study is finished. “We want to be respectful of that process, while also maintaining a sense of urgency around it,” he says. In the meantime, commercial waste collection will soon be subject to new rules from DSNY for separating food waste and recyclables. The rules, which would take effect next year once approved, are part of the city’s goal to streamline commercial collection and reduce waste 90 percent by 2030. Restaurants in hotels with more than 150 rooms, stadiums, arenas, and large food manufacturers and wholesalers will be required to sort their organic waste for separate pick-up or processing. As part of a 2013 law, the DSNY commissioner could extend this requirement to smaller food establishments in the future. New recycling rules for metal, glass, plastic and paper will essentially bring commercial establishments in line with household standards. Under current rules, certain types of buildings aren’t required to recycle all materials. Single-stream recycling, which DSNY plans to eventually implement for municipal collection, will also be allowed. But given the looming possibility of franchising, some carters are hesitant to invest in new equipment to efficiently collect and separate these materials. Tom Toscano, owner of Mr. T Carting, is waiting to purchase new optical sorting technology for his recycling transfer station, new computer systems for his fleet and additional trucks for his food waste collection routes until the issue is resolved. “Am I going to spend six and seven figures to invest or am I going to get put out of business?” he asks. The more than 10,000 tons of garbage that New York City produces a day are taking a rising toll. Can New York come up with a better way to take out the trash? He has already purchased two top-loading, leak-proof trucks which are necessary to contain the large amounts of liquid in food waste and prevent it from spilling it all over city streets. Toscano also recently ordered five new refuse collection trucks, at a cost of approximately $250,000 each, to meet upcoming city emissions standards. He must replace 15 more of his 28 trucks by 2020 to be in compliance. To help improve communication with the city, Toscano has called for the re-establishment of BIC’s Trade Waste Advisory Board. The group of city officials and industry representatives hasn’t met since 2013. BIC did not reply to requests for comment about the board’s status. Toscano says he’s ready to increase his recycling operations, but sees it as being at odds with advocates’ concerns over truck traffic. The industry’s local trade association believes that increased recycling rates are possible under the current system. Transform Don’t Trash, however, argues that a system requiring carters to bid on the exclusive rights to pick up waste in specific zones is the only way to ensure efficiency and more sustainable practices. The lead author of the coalition’s latest report, Justin Wood, says carters should be responsible for educating their customers and making sure recyclables end up in the right place. Wood pointed to a new franchise zoning system in Los Angeles that will require high recycling standards. He says New York’s carting companies should follow the example if they hope to participate in a similar system here. “Those that do show they have the will and capacity to invest will likely be the ones that win these bids,” he says. Two public hearings will be held at DSNY’s headquarters to discuss the new food waste and recycling rules in October. Representatives from both sides of the franchising fight plan to attend. Antonio Reynoso, chairman of the City Council’s sanitation committee, says he is meeting with carters to better understand their concerns and also studying similar franchise systems in California. Reynoso says the study’s delay will give everyone extra time to better understand their options. While officials and advocates work out what could be the industry’s biggest shake-up in decades, others are looking for a potential compromise. 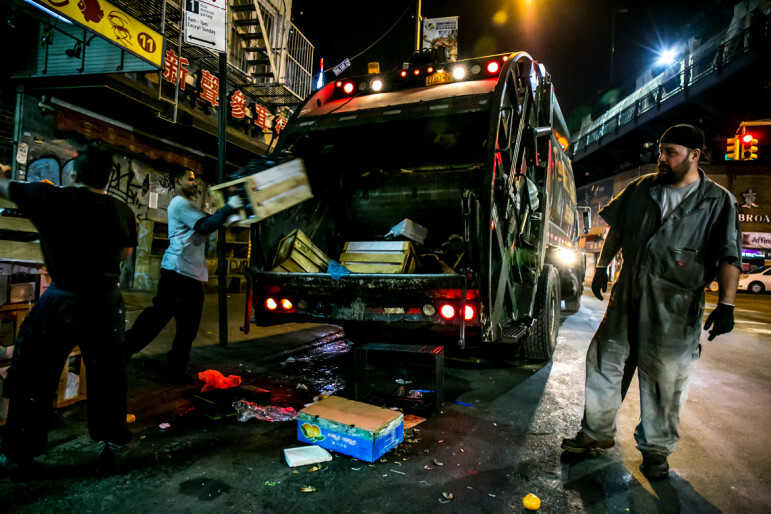 A recently formed coalition called CleaNYC, comprising Laborers Local 108 and three major private carters, says it’s possible to improve waste collection without a franchise system. The companies—Action Carting, IESI and Filco Carting—make up a large percentage of the city’s commercial waste industry. “I think the private sector can get it done”” says Mike Hellstrom, business manager for Local 108. He says the coalition has met multiple times and is considering ways to enforce a wide variety of reforms. Current ideas include mandating organic waste collection, safety features on trucks, a set number of training hours and employee health care as a condition of membership. Hellstrom sees this is a way of achieving higher standards faster, without potentially putting many companies out of business, and says early conversations with city officials have already begun. Exactly right…do you think franchising is the answer? Its not. We have had franchising in NYC’s cable market for years. Full home cable service costs $200 per month while Cablevision owner Jim Dolan-now worth an estimated $20 billion-laughs all the way to the bank. The $3.3 billion, 20-year plan to send Brooklyn garbage to the Seneca Meadows landfill illustrates the growing costs of burying trash.